"Trees should be firmly staked at planting"
Decades ago, researchers discovered that movement of the trunk and branches is necessary for the development of trunk taper (Neel and Harris, 1971). Trees grown in a growth chamber without movement did not develop taper and instead grew taller, while trees in an identical chamber that were hand shaken each day developed significant taper and remained shorter. The traditional two stakes and ties system is the least harmful to trees staked in landscapes. 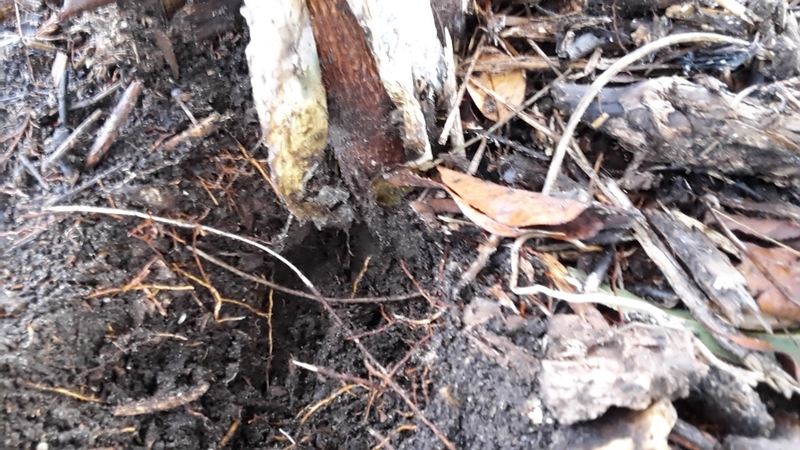 So I got an email with an attached set of photos showing a number of 18 month avocado trees that had broken at the ground line in a wind storm. It looked something like an incompatibility between scion and rootstock, since below the graft union the rootstock girth was substantially smaller than the scion. The problem is, I'd never heard of this between ‘Hass' and ‘Dusa' and the combination has been around for at least 15 years in trials. So it was time to go out to the orchard and see the setting in which the trees had failed. And there was the answer. All of the trees had been planted too deeply. 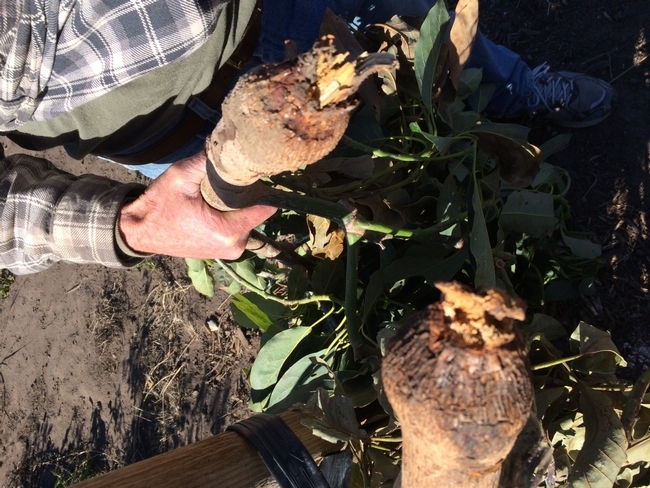 The trunk sleeves had been buried and the graft union was below grade and had been infected by disease organisms. The crown roots are the most active physiologically and that union area is a weak spot. Burying it encourages disease and a weak union. The trees had been planted with an auger and over time the trees had settled into the soft earth and had been buried. The first time I had ever seen something like this was in Guatemala and Costa Rica. There growers had created these massive 3 x 3 X 3 foot holes and amended them 50% with compost. And over time, the trees had settled as the compost decomposed and the unions were covered with dirt. Occasionally you see people moving too fast when they are planting and this shows up in a few trees, not usually a whole orchard. The lesson here, is that if you are going to err on plant depth, plant high. 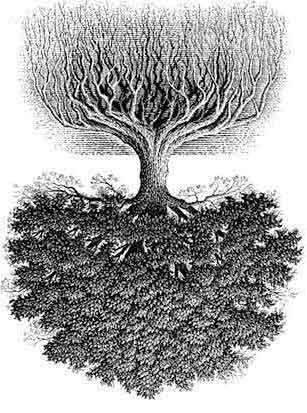 A few exposed roots won't hurt, and the settling problem doesn't become a problem. Of course it's best to plant just right. I am amazed how such a simple procedure can go so wrong. 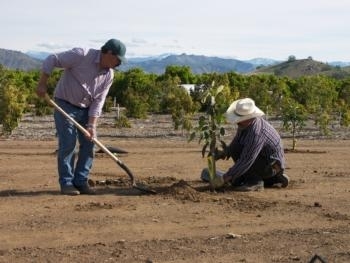 For avocado and citrus growers, it’s time to think about planting in the spring. And every spring and summer I get called out to diagnose trees that are failing. It often turns out that the trees have been planted too deeply. There are various ways of killing a tree, such as digging a hole too deeply and then backfilling. When the ground settles, it settles around the root collar and the tree suffocates. Or installing a dry root ball and then not irrigating soon enough. Or adding fertilizer to the planting hole which burns the roots. One of the major problems of lack education and supervision of the planting crew. Don’t assume that everyone knows how to plant a tree. 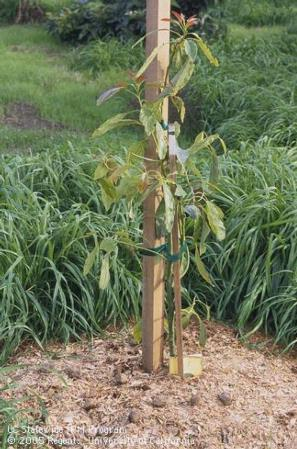 Deep planting can result in death of woody plants either because they rot in moisture saturated soils or they dry out. In either case, the symptoms are similar: wilting, sunscald or burnt leaves, lack of growth, leaf drop and eventual death of leaves, shoots and branches. Root balls planted below grade cause several problems at establishment. 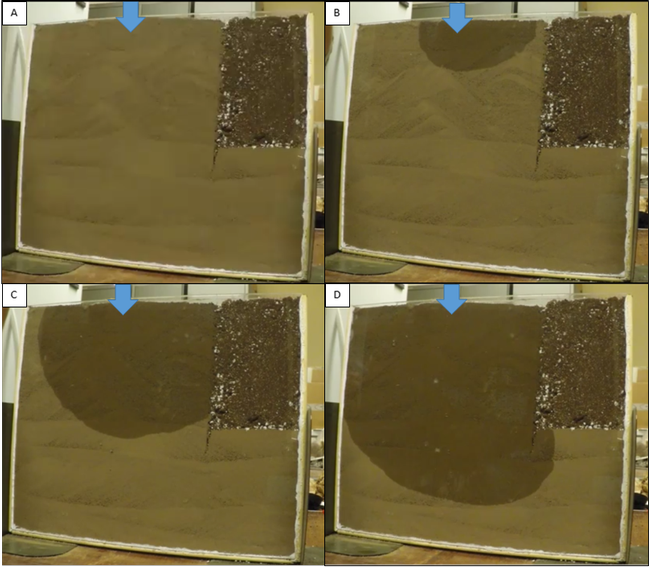 Since native soil surrounds the ball, there is an immediate problem with and interface between the two soil textures. Most container media are lighter than bulk soil, which is done to make sure there is adequate drainage in the nurse. 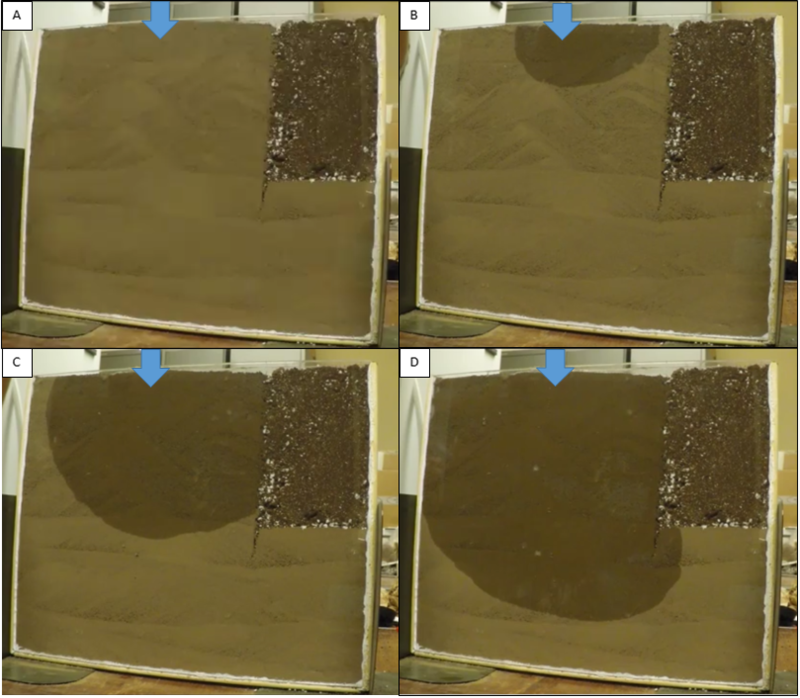 When these soil-free media are planted in soil which is of a heavier texture, the interface does not allow the water to enter the root ball. When trees are planted too deeply, they are much more subject to fungal cankers and other pathogens that can girdle the stem, killing it and all above ground parts. Planting slightly higher than grade will prevent this. Just look for the color, textural change between the roots and stem and dig the hole no deeper than the root ball to prevent settling. 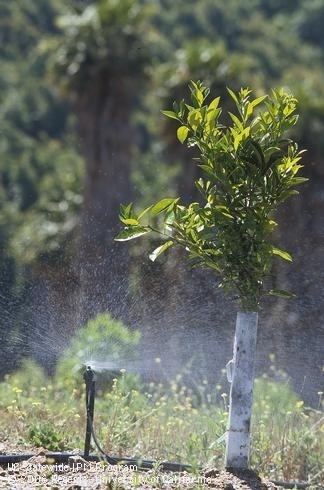 Newly planted trees can’t draw water from bulk soil, not until the roots move out into the soil will they be able to absorb water. Also planting cannot be rushed, because that’s when errors in planting occur.